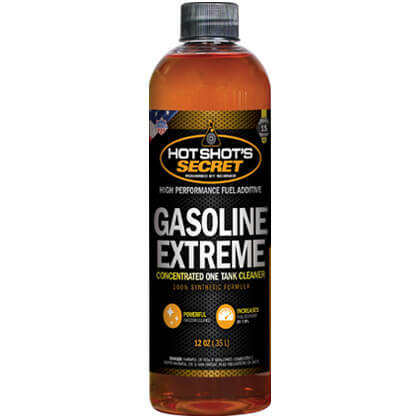 GASOLINE EXTREME is a fully-formulated, concentrated cleaner that removes combustion chamber and intake valve deposits, as well as cleans injectors, valves, pumps, rings and pistons. GASOLINE EXTREME also lubricates key components in the fuel system, including upper cylinders, while restoring fuel economy, power and performance. This product is safe for all emissions equipment. 12 oz (entire bottle) per 15 gallons of gasoline. Use every 6,000 to 10,000 miles. *For best results, please keep treat ratio as close as possible to 12 oz per 15 gallons (partial-tank, multiple bottles etc.). 5 out of 5	Great additive. Ran the gas extreme with the fr3 in the oil, in my 72′ Lincoln SA200. Can’t speak for fuel mileage since it’s a welding machine, but it sure livened up that ol’ flat head continental! 5 out of 5	Great additive! I put this in a 2.7 ecoboost f150 and I can tell a bit of performance and gained 1 mpg! Awesome fuel additive! Works great you can tell the difference. Why do you only have 12oz bottles? All my vehicles have 25 gallon tanks. I know I can order multiple bottles but I can’t afford to. We introduced the product in the 12 oz bottle to test the market demand. Now that the product is gaining some nice momentum, we will offer an additional size of 32oz in the future. I spoke with marketing and production and we think we can introduce the 32 oz in 3 months or less! Levi can you please answer this question. Thanks Levi! Thats great news!